Glass Art editor Shawn Waggoner shares a tribute to David Alcala, who passed away on September 4, 2014. Alcala drew on his master sand artist skills to develop his Flexi-Glass frit technique for creating beautiful panels. He was respected and honored by many for his selfless contributions to glass art. 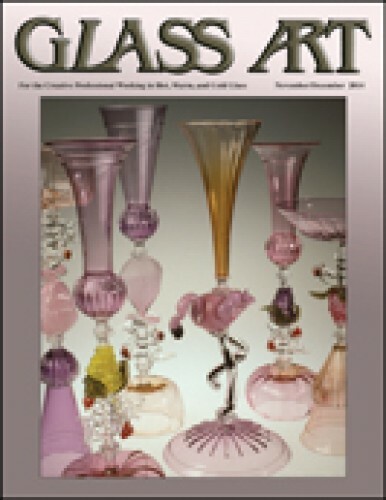 Equal parts artist, scientist, and historian, Fritz Dreisbach has spent the last five decades teaching and demonstrating glassblowing around the world as a real “Johnny Appleseed of Glass.” He also played a vital role in the birth of the American Studio Glass movement that he now strives to preserve. Adam Holtzinger’s experience as a gaffer for other artists requires expert communication and troubleshooting skills but also inspires a deep camaraderie and respect among team members. Through this unique relationship, Holtzinger’s technical skills as a glassblower have grown and flourished as he creates his own glass art. Bullseye Glass Co. has named the winners of Emerge 2014, the company’s biennial juried competition for emerging artists in kiln formed glass. The event attracted more than 320 entrants from a total of 32 countries and 35 universities. Bellevue Arts Museum, Bellevue, Washington, will host the final stop for the exhibit. The Glass Art Society (GAS) will present its 2015 Lifetime Achievement Award to master flameworking artist and educator, Paul J. Stankard, who is known for his botanical themed orbs and paperweights. Glass sculptor and educator, Mary B. White, will receive the 2015 Honorary Lifetime Membership Award for her outstanding service to GAS. UrbanGlass studio has reopened its fully renovated facility, which features a professional hot shop and educational glassblowing studio. Included are separate specialized studios for neon, flameworking, cold working, molds, kilns, and flat glass. This nonprofit organization also made sure that the renovated space was designed to promote greater energy efficiency. The techniques used by French Art Nouveau artists Décorchement and Dammouse resulted in delicate glass art pieces with eggshell-thin walls. Shin-ichi Higuchi was allowed to observe the work of Dammouse first-hand by Kitazawa Museum of Art and shares his experiments with ways to reproduce these techniques in modern-day glass art. Social media arenas have become a large part of the business world, which must periodically re-evaluate how to utilize this resource. Determining which sites best serve a particular business, knowing the audience and its needs, and offering quality photos plus extra value are important to attracting visitors to these sites. Replication painter, Indre McCraw, has learned her craft from masters who are no longer with us. In learning to re-create their style and imagery while working on prestigious commissions from many well-respected stained glass studios, she is now able to incorporate elements of each master into her own artwork. The Stained Glass Association of America (SGAA) 2015 Summer Conference Exhibition in Portland, Oregon, will be sponsored by Uroboros Glass. Artists’ work that is included in the upcoming exhibition will carry the mythical Uroboros design theme into glass as a panel, jewelry, sculptured three-dimensional art, or other format. Vetrate Artistiche Toscane preserves the rich tradition of stained glass production first practiced in 12th century Siena, Italy. The studio offers Painting on Glass one-month apprenticeships each year for beginning, advanced, and professional levels, as well as one-week classes, with participants working on current studio projects. The American Glass Guild (AGG) Summer 2014 conference was an astonishing event that was held on the grounds of Bryn Athen College in Philadelphia, Pennsylvania. The campus offered an abundance of excellent venues for exhibiting the remarkable glass art that was part of the conference. Sister publications, Glass Art, Glass Patterns Quarterly, and The Flow, join with the Glass Craft & Bead Expo to recognize up-and-coming glass artists through the Glass Craft Emerging Artist Award. The 2014 winner is flameworking artist and teacher, Filip Vogelpohl, founder of Boise Art Glass in Boise, Idaho. 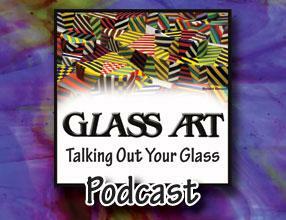 The 2014 Glass Craft & Bead Expo celebrated 20 years of supporting the glass art industry. An important part of the Expo was the annual Gallery of Excellence featuring six categories of glass art from which the winner of the 2014 Glass Craft Emerging Artist, Filip Vogelpohl, was selected.